Sweet Almond Oil is excellent for the skin and can be used by itself for moisturizing all skin types. 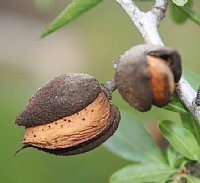 A favorite with many aromatherapists, sweet almond oil blends well with other oils and penetrates the skin easily. Very rich in fatty acids, this oil is an excellent choice for damaged skin, especially if blended with equal amount of calendula oil. For mature skin, mix sweet almond with 10% tamanu, rosehip and avocado oils. Click on Aromatherapy Carrier Oils for more information on our carrier oils.